21 Mar 2017 --- DNA technology tracking the exact “farm to fork” journey of shrimp is being used in a new traceability program to guarantee greater transparency and to help the seafood industry shake off controversies of the past involving child labor, excessive antibiotic use and poor quality. The DNA TraceBack program for shrimp production has been launched offering consumers 100% scientific assurance on the origin and quality of the shrimp, in a similar way the technology is already used in the meat industry. And the enhanced technology of TraceBack also helps to promote ethical labor practises, which have been highlighted in the global shrimp industry. The traceable shrimp will be sold at Marks and Spencer outlets in the UK, the first time such an offering has been brought to the consumer. IdentiGEN co-founder and director Ronan Loftus said that shrimp are globally sourced and the application of DNA TraceBack to the industry brings a further degree of accountability to production and labor practices, which are increasingly being demanded by both retailers and the consumer. He said that recent scientific advances in DNA technology has made traceability deliverable at a large scale, enabling its expansion into the seafood sector. “A sample taken from a female shrimp can be used to trace all of its progeny (hundreds of thousands of shrimp) back to its farm of origin with unprecedented accuracy – through the use of ‘Nature’s Barcode’. The program is currently being operated by Seafresh which is producing the shrimp in Central America, processing in the UK and supplying to Marks and Spencer. “We are delighted to partner with IdentiGEN and our customers on this exciting new era for shrimp traceability. Our industry has been dogged by claims of child labor, poor production practices and use of unapproved feeding regimes. The unprecedented levels of supply chain transparency will help us convey more effectively to our customers and the consumer the care we take to meet the growing consumer expectations for a top quality, sustainable and ethically sourced shrimp supply,” said Seafresh CEO Lasse Hansen. Meanwhile the Marine Conservation Society (MCS) has downgraded the sustainability ratings of some stocks of haddock; stocks in the UK around the North Sea and the coast of Scotland have slipped off the "Fish to Eat" list, and are now considered "OK to eat occasionally." As the second most popular fish eaten in the UK (after cod), found in just about all the 10,500 fish and chip shops in the UK, many large caterers, public sector institutions and universities have committed to sourcing only verifiably sustainable fish by taking the Sustainable Fish Cities pledge. However fish buyers still have to be sure they are sourcing haddock sustainably, according to the MCS which has an online “Good Fish Guide” to check where haddock is from. 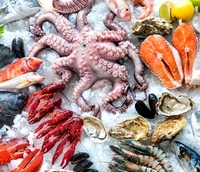 Users should look for the Marine Stewardship Council’s fish tick ecolabel and MSC-certified fish can be found in all the major retailers, as well as in more than 100 fish and chip shops in Britain and hundreds of workplaces, universities and schools. “These ratings changes have come about because scientific perception of the stock has changed. Compared to 2015, the stock numbers in 2016 were below the recommended level and at the point where action is now needed to increase the number of fish of breeding age,” says Bernadette Clarke, the Good Fish Guide manager at the Marine Conservation Society. The haddock stock in the North Sea is shared between European countries and catch levels are currently set by the EU quota system. It is absolutely vital that when the UK withdraws from the EU, the catch levels for Haddock (and other species) continue to be set at precautionary, science-based levels, or the stock is at serious risk of becoming overfished, stress the MSC.